This recipe isn't anything new. It's pretty much a classic stir fry. We simply wanted to share our method and ingredients and let you know how filling and satisfying this dish is. 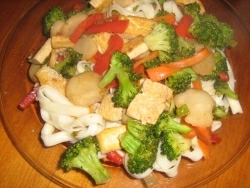 Sesame Tofu Stir Fry with Udon Noodles - as we said, this is pretty much a standard stir fry. But we love it. Sesame adds a decidedly distinctive flavor and the Udon noodles are simply the best! It is also a reasonably easy and quick dish to make - especially good for those evenings when you just get home from work and don't really feel like going all out for dinner prep. And this tofu stir fry has more than 7 grams of protein per serving as well! We think you'll like it! Drain, press* and cube the tofu. In a large skillet heat the oils (sesame and eevo) over medium-high heat. Carefully place the cubed tofu in the skillet once the oil is hot. Fry it until it starts turning golden. Then add the carrots and cook for about 3 minutes. Add the water chestnuts and cook for 3 minutes. Then add the onion, broccoli*** and peppers and cook for another 3 minutes. Add the soy sauce and stir to coat. Then push the tofu and veggies to one side of the skillet, tilt the skillet slightly toward you and add in the corn starch. Stir for a few minutes while keeping that side of the skillet on the stove (hot). The cornstarch will begin to thicken. Finally, turn the heat down to low, thoroughly mix the soy sauce and cornstarch back into the mixture of tofu and veggies. Add the tabasco. Cover and allow to low-simmer while you cook the noodles. To cook the noodles fill a large saucepan with 6 cups of water. Bring to a boil. Add the noodles** and reduce the heat to simmer. Cook for about 5 to 7 minutes, or until noodles are tender. When noodles are cooked and drained you can plate then and top with the stir fry or gently fold the noodles into the stir fry while still in the skillet. Serve with fresh sliced pears or oranges. Remove the tofu from the package and place it on a clean cotton dish towel. Fold up the sides of the towel to "wrap" the tofu and gently press with the palms of your hands. Flip it over and repeat. Finally, place a reasonably heavy object like a large Dutch oven 1/2 filled with water on the tofu and allow it to stand while you sliver the pepper and carrots. ** When prepping the water for the noodles you might want to add just a dribble of olive oil to the water. This keeps the noodles from clumping or sticking together. *** You can lightly blanch the broccoli before hand in a small saucepan of boiling water if you prefer it more "tender".